A 48-year-old non-smoking man underwent laparotomy for peritonitis immediately after taking ibuprofen 800 mg 6 hourly for 14 days for back pain. His only other medication was long-term omeprazole 20 mg per day. At operation he had three separate perforations in his proximal jejunum. Fifteen centimetres of jejunum were resected with primary anastomosis. 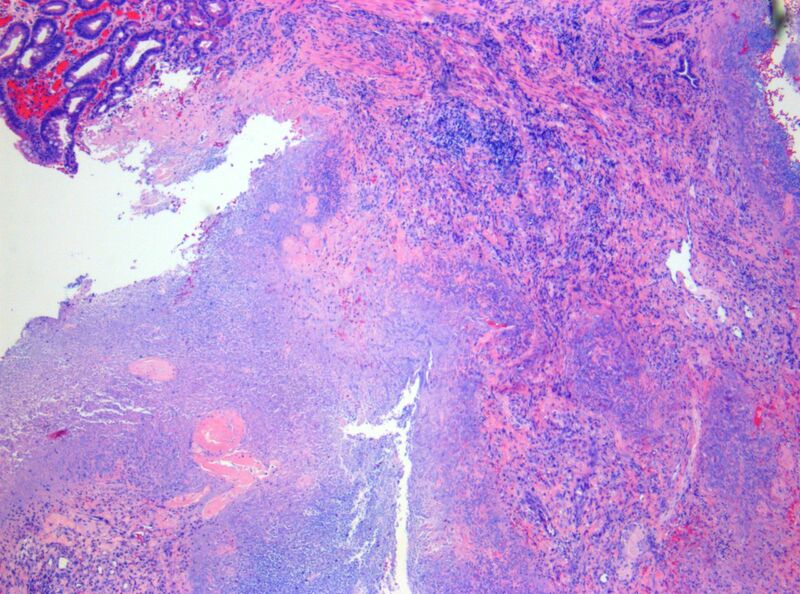 Histology showed focal mucosal ischaemic changes with normal mucosa between. There was no vasculitis. The perforations were attributed to ibuprofen intake. He made an uneventful recovery and was instructed to refrain from non-steroidal anti-inflammatory drug (NSAID) intake. He was readmitted 5 months later with abdominal pain. He had continued omeprazole but had taken no further NSAID. 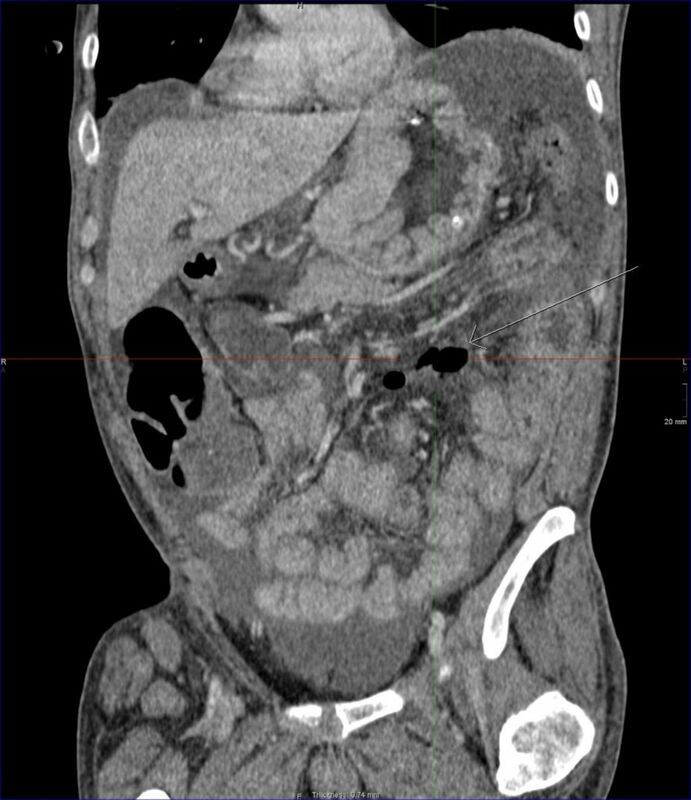 CT showed extensive free intra-abdominal fluid with free gas adjacent to his proximal jejunum (figure 1), indicating a further perforation. This was confirmed at laparotomy when a 5 mm perforated ulcer was found in his proximal jejunum (figure 2). This was repaired and a serosal patch was applied. Histology from the ulcer margin showed ischaemia and infarction (figure 3). He made an uneventful recovery and remains well 1 year later. Investigations including serum gastrin, a connective tissue disease screen and thrombophilia screen have been normal, implicating ibuprofen as sole causation for the jejunal ulceration. Reformatted coronal CT showing free gas adjacent to the proximal jejunum (arrow) and free fluid in the pelvis. 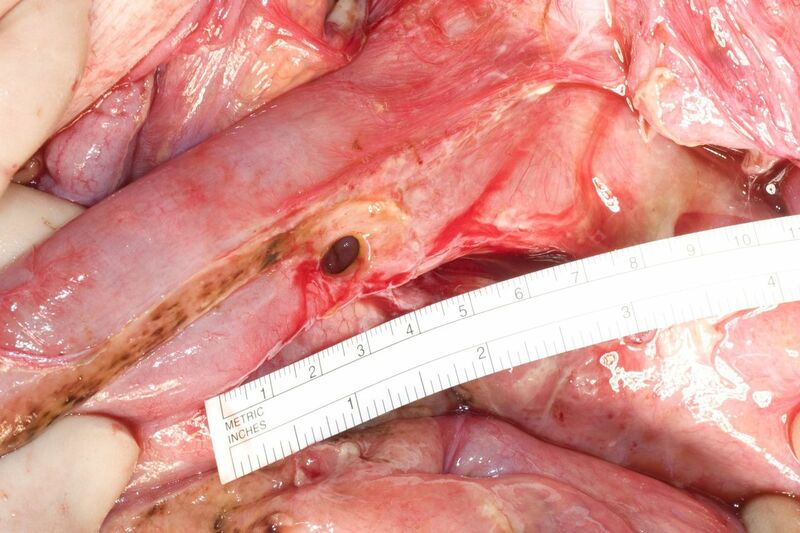 Operative photograph showing the perforated ulcer in the proximal jejunum. Histopathology slide of jejunum H&E ×50 magnification showing ulceration and granulation tissue. Jejunal perforation is a recognised but rare complication of NSAID use1 2 and is reported to occur in 0.0047% of ibuprofen users. It is known that NSAID can cause small bowel strictures many months after NSAID intake has ceased as a result of an initial microvascular injury to the villous circulation of the small bowel mucosa.3 This allows entry of bacteria and their products into the mucosal cells causing further damage. It has recently been reported that the simultaneous use of proton pump inhibition is a risk factor for NSAID-induced small bowel ulceration.4 This is because proton pump inhibitors induce changes in the type and numbers of enteral bacteria. A similar mechanism may explain this previously unreported occurrence of delayed jejunal perforation following short-course high-dose ibuprofen use. Short-course high-dose ibuprofen use can cause both early and delayed jejunal perforations in susceptible individuals. Proton pump inhibition exacerbates non-steroidal anti-inflammatory drug-induced intestinal damage by inducing dysbiosis.
. Multiple indomethacin-induced jejunal ulcerations with perforation: a case report with histology. Am Surg 2007;73:344–6.
. Surgical complications of nonsteroidal antiinflammatory drug-induced small bowel ulceration. J Am Coll Surg 1997;185:250–4. Contributors AY, SB and SP identified this case as worthy of publication because of its clinical importance. HV undertook the radiological investigations. All the authors were involved in the literature search and in writing up the case report.